Playing with toys is a very important part of a cat’s life. It helps hone their skills as a hunter, keeps their eyes trained and senses keen, as well as being ever so entertaining for us to watch as they charge full throttle across the room and pounce on that menacing plastic ball with a bell inside. Appropriate and exciting toys can also distract your cat from a lot of bad behaviors. Scratching furniture, digging in house plants and some other obsessive habits can be caused by boredom and excess energy. Play is not only a distraction from these things but exhausting, and a tired cat has very little energy to climb your new curtains. Play is also essential to your cat’s health. The physical exercise keeps their muscles lean, their heart strong and their weight down. Hunting prey is an essential feline behavior, consuming about 15% of a cat’s day. Modifying your environment with appropriate prey toys can help prevent your legs, hands, or other unwanted objects in your home from becoming the target of your cat’s hunting sessions. Playing is also a great opportunity for bonding between you and your cat. 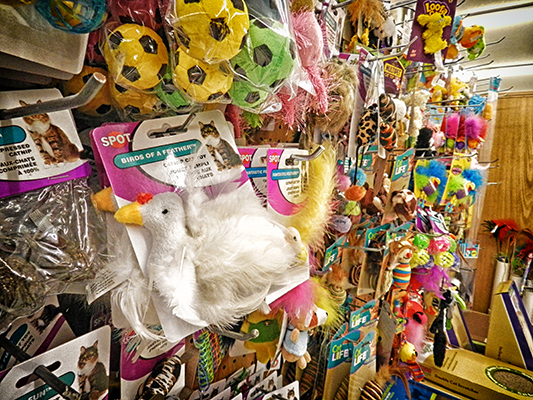 We have a lot of cat toys that can be used by your cat while you’re away; toys that dangle off of a door, toys they can bat around on the ground, toy mice that dart around inside a plastic circle. Cat toys are a great way for you and your cat to play together. We have a huge selection of toys for your cat. 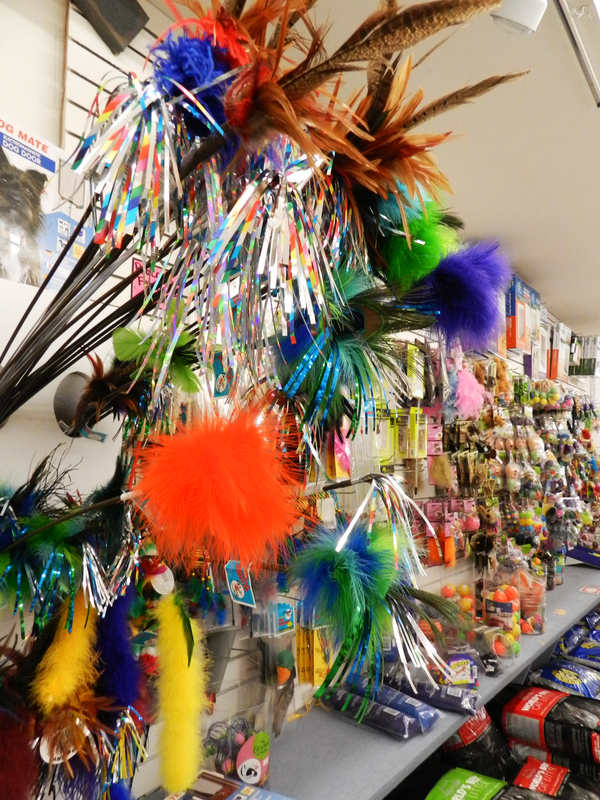 Toys at the end of a “fishing pole” are great for those cats that have claws and teeth that come out when they get a little excited. For the cats that like to play catch there is a variety of small plastic or foam balls and stuffed items in the shapes of fish, mice or birds. For wrestlers we have all sorts’ larger stuffed items great for tumbling with and simultaneously biting and scratching. The laser light pointers are always fun, cats love chasing the red light wherever it goes while you get to sit and relax, this make it a great toy for elderly cat owners. 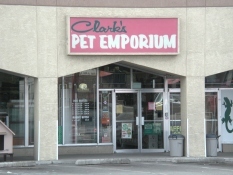 We also carry a big selection of toys filled with catnip to hold your cat’s attention longer and get their heart pumping. 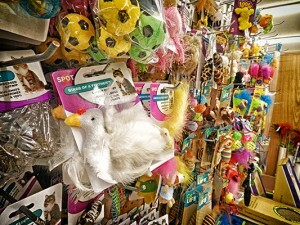 Our pet shops have the BEST selection of cat toys in Albuquerque.